Do you have a business with a physical (brick and mortar) location? If so, have you optimized your website for local search? If the answer is “no,” you are missing a prime opportunity to expose your business to more people in your area. As with all things Google, the local search algorithm is constantly subject to revision. However, there are constant ranking factors that persist throughout algorithm changes. Using this local SEO checklist will position your business to outmaneuver competitors and vault to the top of searches. Local SEO is the practice of improving search visibility for businesses with physical locations. 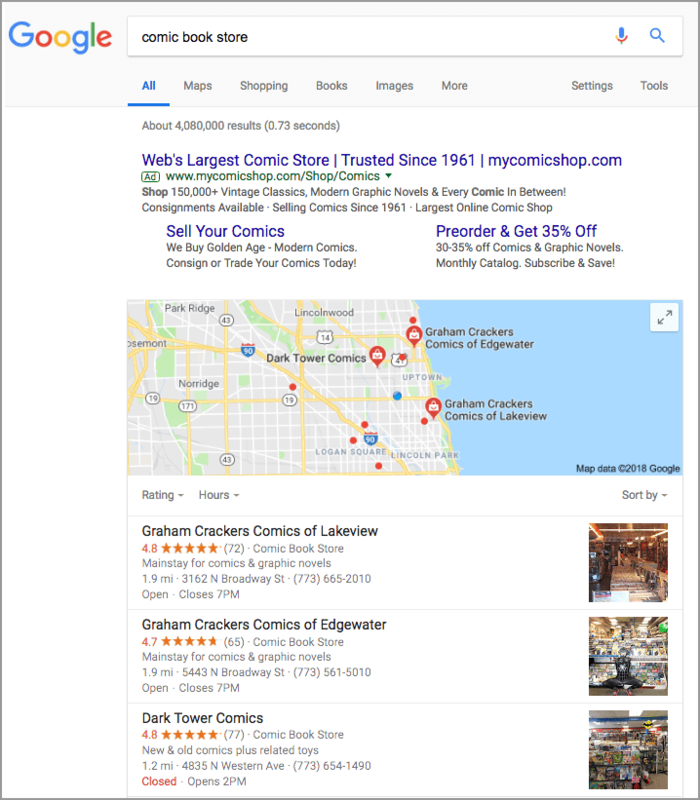 When Google determines that you are searching for a local service or product, the traditional ranking algorithm goes out the window. Traditionally, measures like a site’s backlinks and domain authority are a good predictor of how Google will rank search results. Higher authority, well-optimized websites will often see higher ranking positions. 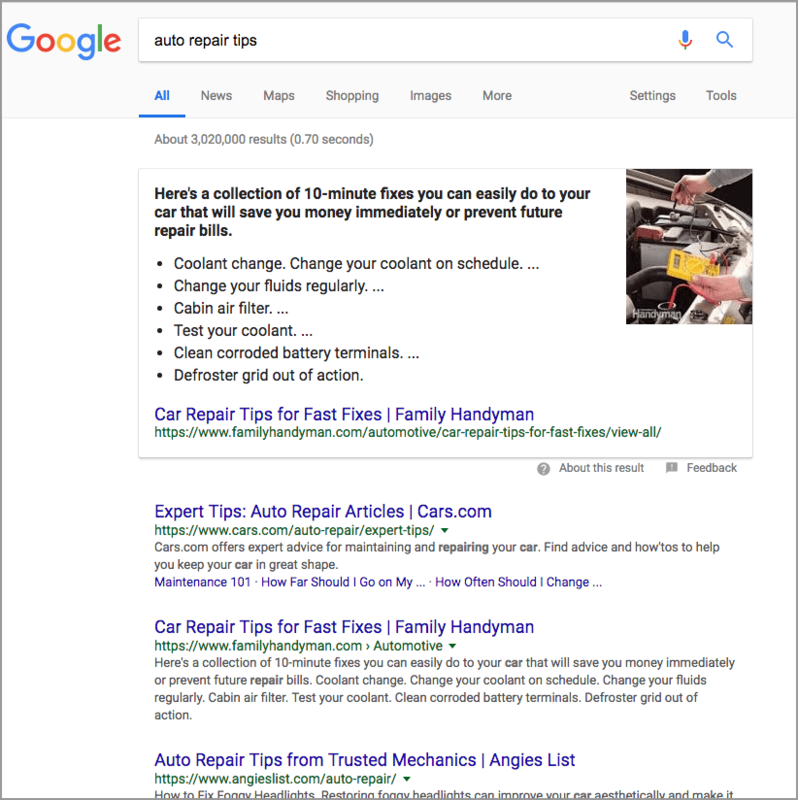 For example, if I search for “auto repair tips,” Google is going to try to offer results that are relevant (keyword matching) and trustworthy (decent authority/link profile). However, if I search for “auto repair”, now Google assumes that I am looking for a service, not for knowledge. This reorients search results based on local SEO optimization. Follow this local SEO checklist to make sure that your website covers every ranking factor. But first, a word on the local pack. Partially the Google snack pack results are based on proximity – where your computer tells Google you are located. Google wants to prioritize the best results that are also the easiest for you to get to. 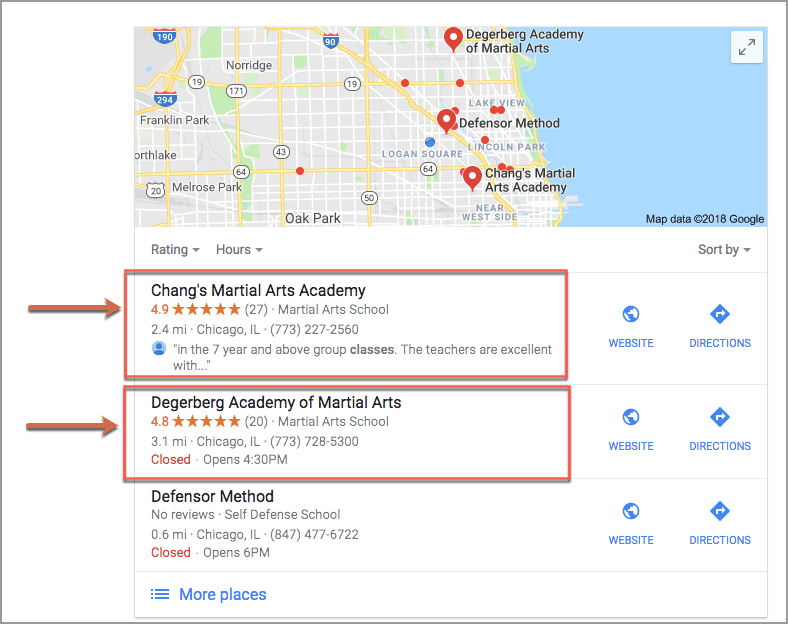 The rest of the Google local three-pack ranking is based on a mix of on-page optimization, coding and reviews. If you have a business with a physical, brick and mortar location, there are ten elements that go into local search engine optimization. Add these to your checklist to ensure that your site is ready to compete. Google is a robot, and that robot needs to be told certain things very clearly. Every homepage should have an H1 headline and meta content that very clearly describes who you are and what you do. Some people say “soda,” some say “pop.” Use the words your local audience uses. 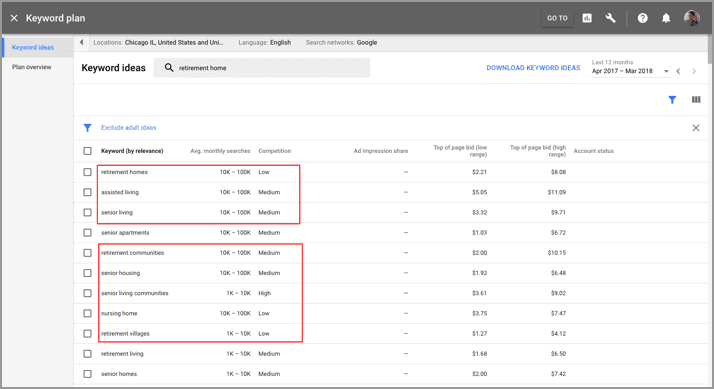 For example, Google Keyword Planner allows keyword search filtering by location. Unless you are spending money on paid ads, Google won’t give you exact numbers of people searching for these terms, but you can at least compile a list of words that are actually being used by searchers. Even with the loose numbers that keyword planner provides, you can compare the relative popularity of keywords. Once you’ve compiled a list, use these relevant keywords in your site copy, meta content, headers and URLs. Make mention of local neighborhoods and landmarks. 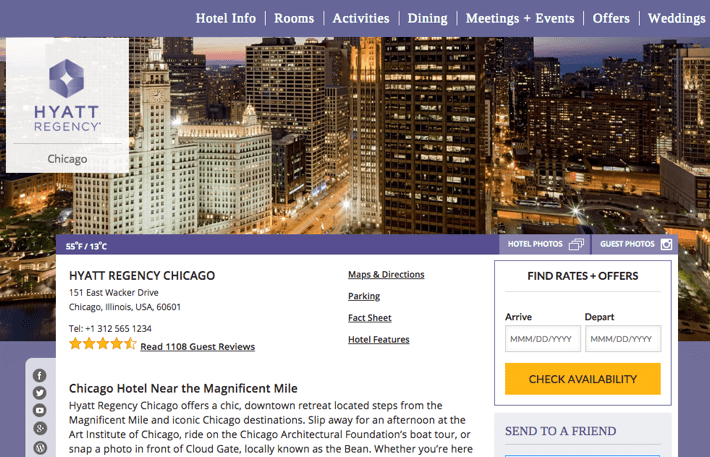 If your downtown Chicago restaurant serves lunch, then terms like “lunch in the Loop”, “best lunch menu in downtown Chicago” or “just steps from Millennium Park” help search engines build locational context around your business and better deliver those results. Building content around local terms can also benefit local search engine optimization. Local pack results are restricted by the physical city/address of your business location. Just say no to the “products and services” page. Each page on your website should have one clearly defined topic. When you lump all of your products or services onto one page, it becomes difficult for a search engine to cite you as an expert in any one area, thus diminishing ranking potential. Look at this example. This agency needs a page for content strategy (ideally titled Content Strategy Agency), a page for User Experience (titled User Experience Agency), and so on. Google will never direct a searcher to the mishmash page they are using now, but would be more likely to direct someone searching for “content strategy agency” to a fully dedicated page that matches that query. 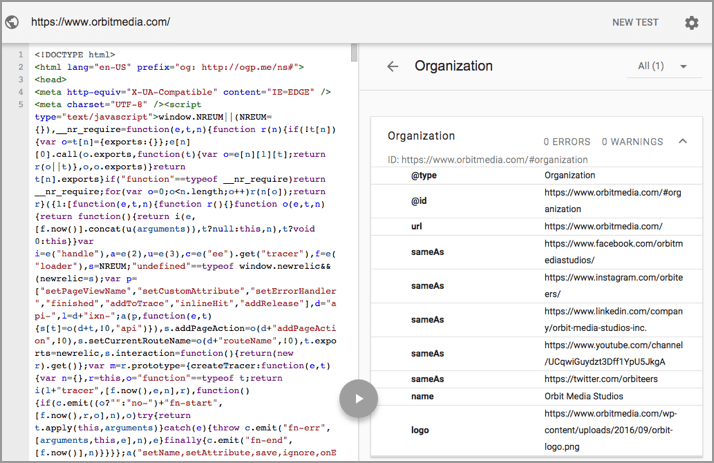 Structured data is an addition to the code of a page that gives search engines more information to aid in understanding of the page. In the case of local schema, you are providing search engines with your businesses names, address, phone number, email, services, hours of operation and any other information that will help display your business properly. While you are adding schema, add “product” or “service” schema to each product or service page on your site. This will tell a search engine where you are and what you do. NAP stands for name, address and phone number. This information is an important element of local SEO and should be included on every page of your website. This could be in a shared element like the header or footer. If you have multiple locations, create a page for each location that contains that location’s respective NAP. Include your complete address down to the zip code. If you are in a big city, you may want to specify the neighborhood you are in as well (examples might be Echo Park, Greenwich Village, Lakeview or Midtown) and a Google map. Lots of sources of information feed into a search engine’s understanding and display of your business. 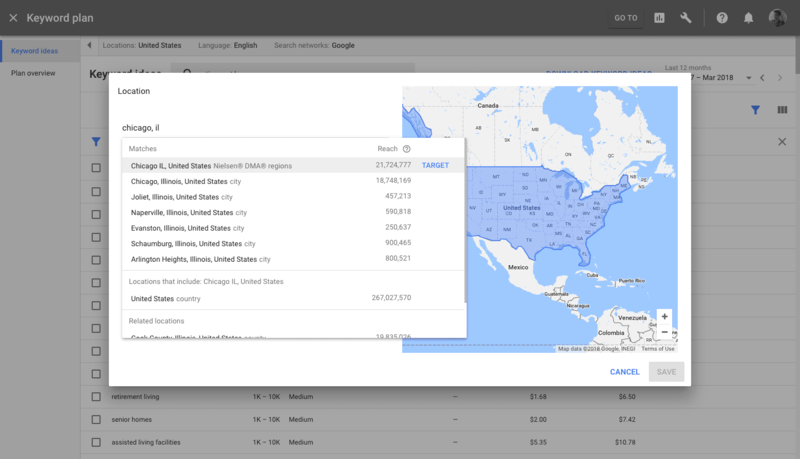 On Google, users will see this information graph when they select your location on a map or from the local pack. It is a place where customers can write reviews of your business. For many customers, this will be their first introduction to your business, so make it a good one. One major source of data for this information graph is Google My Business. You need to either add a Google My Business page or claim the existing one (also, claim your Bing Places for Business page while your at it). Once you have claimed the page, you can make sure that the NAP, website information, business categories and hours are correct. You can also add photos of your building, products, logo and staff. Also, you can select up to three categories for your business. Google offers almost 2,400 different business categories, so take advantage of this to accurately describe the niches your business fits into. If you have a business with multiple physical location (whether this is McDonald’s with 14,000 US locations or a local sandwich shop with three locations), you must create an optimized page within your website for each location. 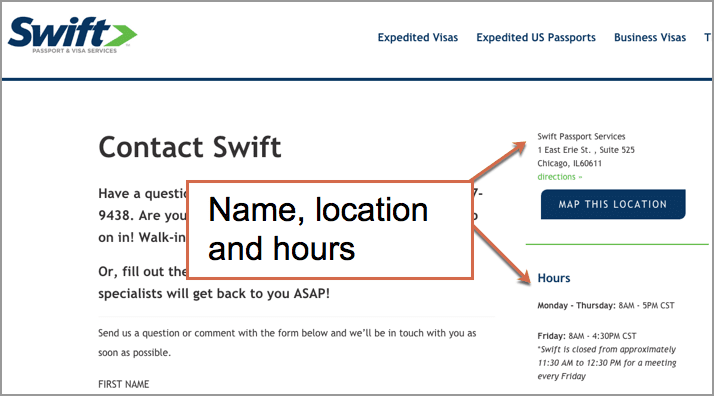 Each location’s page must include the location’s NAP and local business schema. Additionally, you must create a unique Google My Business page for every location. There are a series of local directories that search engines are referencing to determine local search rankings. To ensure Google has your address right, check your listing information in all the directories to ensure NAP consistency. You can get a free local assessment of your site using MOZ Local. 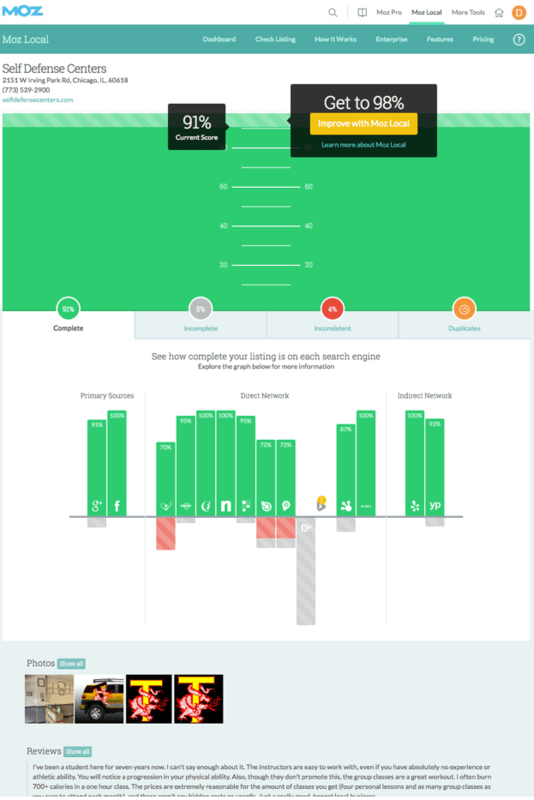 As you can see in the image below, MOZ Local will give you a free assessment of your site, showing completeness and consistency across all relevant directories. For about $100 per year per location, MOZ Local will automatically align and maintain your listings in many of these directories and help guide you to duplicate and incomplete listings that need to be addressed. Google wants to provide the best possible answer to your query. That means they don’t want you to feel like they led you to a bad business. That’s why Google makes reviews a factor in local rankings. Do a search for almost any local business and you’ll see Yelp on page one. Even if you can’t rank on page one for a local search, Yelp probably does. Make sure that Yelp has the correct NAP information for your business, and pay attention to reviews – thank people for kind reviews and try to respond in a helpful manner to any negative feedback. Google My Business reviews are also very important. They are shown in the local pack, which can help improve your click-through rate from search. Google is also logging and displaying Facebook reviews, so make sure you have a brand page set up there as well. Garnering reviews must become a regular part of your work process. As much as possible, gently ask or remind customers to review your business. After I get my car serviced, my mechanic gives me a card for a free oil change and asks that I take a few minutes to write a review of his business. If your customers like your business, then they want you to succeed; let them know that good reviews are the best way to help. While the standard ranking algorithm is disrupted for local search, links still matter. Taking the time to build links can be difficult for small businesses. Links are the best measure devised to demonstrate authority. A search engine sees links from other websites back to your site as a “vote of quality” for your site. So, it is still in your best interest to build links where you can. There are a lot of strategies for building up links to your site. You might start with local relationships. Think about other business you work with, organizations like your chamber of commerce and charitable organizations that your business supports. These are great places to ask for a link as you think about larger strategies. Build up links to your site. Brainstorm some was to start asking for links. If you have any other thoughts or ideas, we’d love to hear them in the comments below. 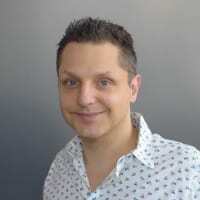 Ryan Johnson is a guest blogger. Can’t import YT URLs yet but every post brings more traffic. 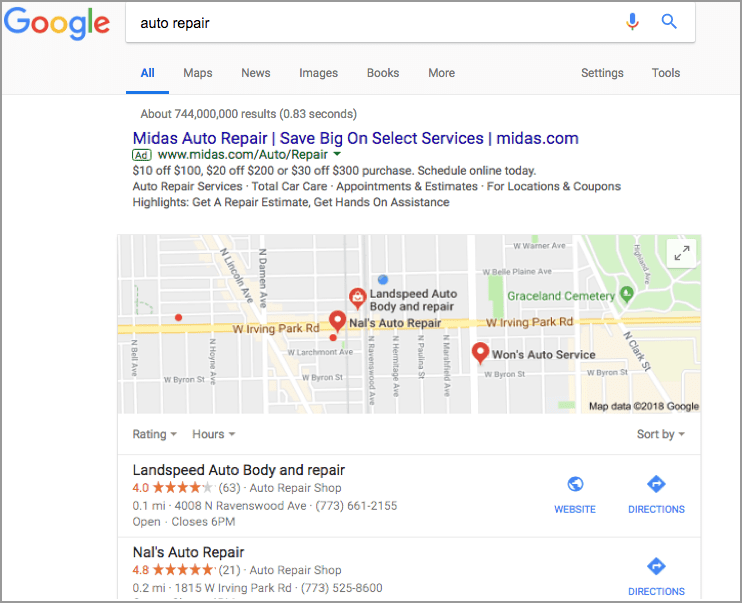 There are a lot of free and easy fixes that small businesses can take advantage of to improve local rankings and GMB is definitely one of them. It’s great for building reviews and for feeding into that information graph. The local algorithm is not only relevant for brick-and-mortar businesses, but there are some people who may not have a fixed location but work in the community (such as real estate agents, locksmiths, landscape professionals, contractors, plumbers, gardeners, electricians, home painters, and more). These are service-area businesses and they represent a considerable percentage of local businesses. Personally I don’t think Google has done a good job of figuring out a way to serve these types of results well, at least not reliably, where our jobs as SEOs can become straightforward. Proximity is an important topic in local SEO but it seems unfortunate, since proximity to the home office is a poor way to serve results for Service Area Businesses, since a plumbing company based outside Chicago might have 50 trucks roaming the streets of Chicago, while a company with a head office in downtown Chicago might have just 1 truck available. Calling the company with 50 trucks is much more likely to get me a plumber ASAP! Then, there are some professionals who may not work in a brick-and-mortar but who do work out of a home office without ever seeing their clients. The growing sector of home-based travel agents is a great example, then you have freelancers such as web designers, SEOs, and writers all can serve their local area. The algorithm is challenged with these professionals because they can also serve clients anywhere else in the world, but the algorithm is still triggered for local results for a lot of these types of people. Overall a great article, very good points for your average brick-and-mortar business. Often overlooked for local SEO, keyword research is still very important! Thanks for the thoughts Daniel. Unfortunately, Google’s reliance on proximity and physical city boundaries has only increased with recent updates. For businesses that serve a wide area, there is no “right” answer. One tactic is to try to create content that addresses the various communities you serve, either in the form of informational web pages or in blog posts (a little of which I go into in the article). Additionally, when we look at the “one truck vs 50 trucks” scenario, there are still other elements at play in local that can help people make decisions, such as ratings. More ratings (as a company that serves more people would have) and more links (as a bigger company would have) do still factor in. Those companies also have the option to engage in paid search – a must for hyper-competitive, immediate-need businesses like plumbers. As for businesses without a physical location, they are kind of screwed with the current system. They could still rank in searches by optimizing around “Chicago masseuse,” or whatever, but they won’t get in the local pack. The best bet might be to claim your home as a location or rent a small space just to have a physical presence. Just because you have an office somewhere doesn’t mean customers will show up there – nobody goes to a plumber’s office location. You just have to be able to get a letter there to claim the GMB page.